The Jhumka Diaries: 3 Golden Rules to Dressing Right for a Conservative Work Place - Divassence! Finally the Office Edition of Jhumka Diaries is here! And I’m going to start off by stressing on a few things that you SHOULD be avoiding when it comes to wearing something ethnic to office, especially in a conservative environment. Here is an outfit I put together to give you an idea. A plain off white top, a plain brown-taupe color chudidar along with a printed kalamkari dupatta looks crisp and yet right for a conservative office scenario. If you decide to go with printed tops go with a plain salwar/chudidar and a plain dupatta (think blue printed top and a white chudidar and dupatta). NEVER wear leggings to work, since it isn’t appropriate work clothing. Also I wouldn’t recommend wearing synthetic salwars/sarees to work. It does not look appealing and again, is not appropriate for an office scenario. If you are on the heavier side wear a printed top. Always go for a knee length or a full length kurta while wearing a chudidar. If you are short, make sure you wear a chudidar instead of a salwar. 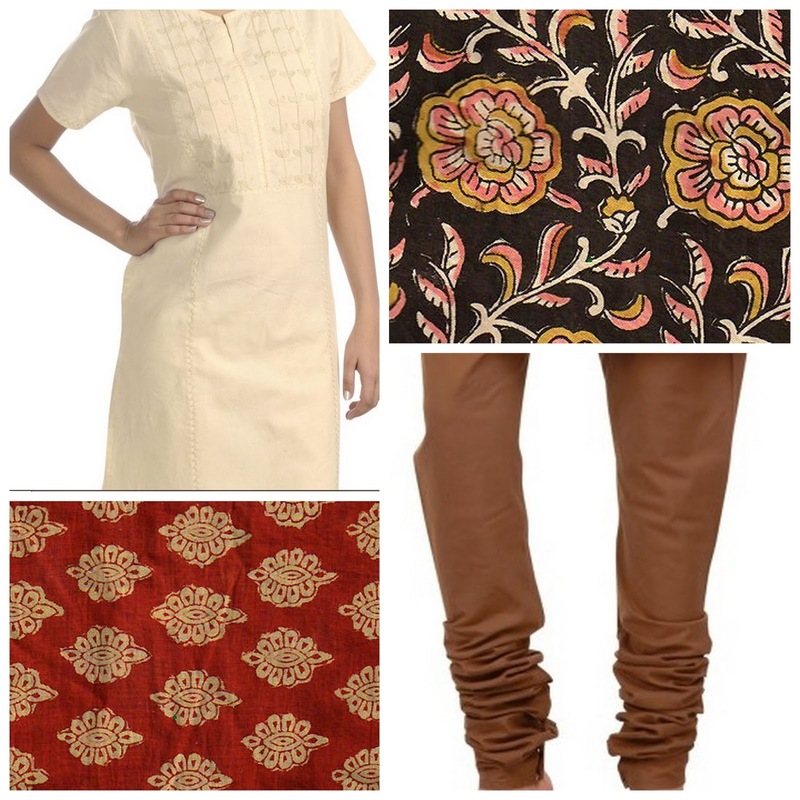 If you find that pure cotton kurtas get crumpled easily, go for a cotton mix. Cotton sarees look crisp and elegant. Depending on the colors pair it with bronze or silver jewellery. Statement earrings: Statement earrings are a NO-NO to work! No jhumkas either. I would recommend wearing earrings like you see in the picture below. For the outfit shown above, I would probably pick the bronze earrings or the teracotta butterfly ones. 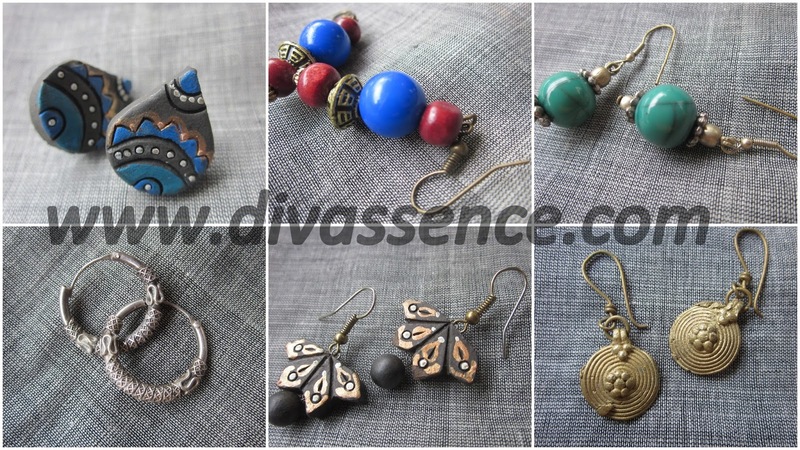 Too many pieces of jewellery: A lot of people wear earrings, bangles, necklaces, anklets and hair accessories to work which sadly do nothing to enhance their look or outfit. When you decide on wearing a particular bracelet like the one shown below, go for a simple pair of earrings. I would recommend a stud with pearls or just simple rings. If you decide to wear a neck piece go for a pair of earrings that would let your neck piece be the star and maybe a finger ring or two. Nothing more. If you still have doubts regarding pairing jewellery or clothes, do not worry. There will be more detailed articles on these and OOTDs as well.